Nearly everything has changed in the magazine business in the last 100 years. As I began the model I figured it would be pretty simple because the drawings looked nice. I should know better. The drawings aren’t dimensioned so I referred to the “Bill of Materials”, but soon discovered that most of those dimensions didn’t match the drawing. In a short while I discovered that the two elevations, one from the end and one from the long side didn’t agree with each other. The difference was about half an inch in height. That sounds like a lot (and it is when you build) but that’s an easy error to make when you’re drafting by hand. 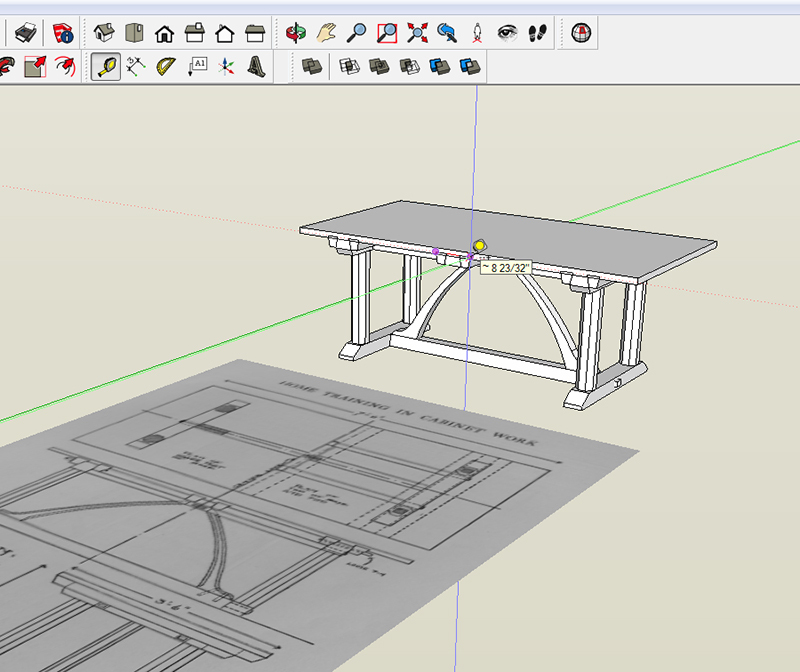 To make this model, I imported an image file into SketchUp and scaled it to actual size to use as a reference. If you want to learn how to do that, Chapter 12 of the “New Woodworker’s Guide to SketchUp” explains the process in detail. wow. I have The Craftsman on CD and will have to look it up. The table makes my someday list.